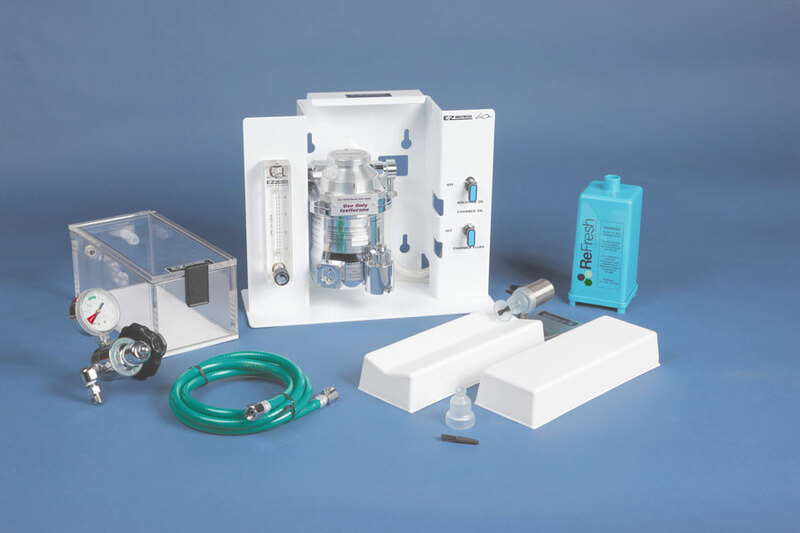 EZ Anesthesia is the system of choice for anesthetizing small animals, and it comes with a variety of choices. Animals to be anesthetized are placed in the acrylic induction chamber, and the system delivers a precisely blended mixture of oxygen and isoflurane. An activated charcoal air filter canister at the top of the chamber releases safe, filtered air back into the room. A water-heated cage warmer or warming plate (ATC2000) is used to retain the animal body temperature while in the induction chamber. After the initial anesthetizing, the animal may be moved to the heated surgical water bed and positioned properly in the snugly fitted nose cone. A highly sensitive valve regulated by the animal’s breathing works with the nose cone to ensure non-re breathing efficiency. It allows safe anesthesia for up to several hours.